Despite the United Reformed Church (URC) General Assembly renewing its support for the Nestlé boycott in July 2010 until such time as Nestlé stops systematically violating international baby food marketing standards, the Church has announced the end of its long-running support for the boycott campaign, even though Nestlé continues to "routinely" violate the standards. This move has resulted from the URC Mission Committee (which represents Church and Society issues) "issuing an instruction to its Mission Council meeting to terminate the boycott of Nestle products." The Mission Council serves as the executive of the URC between General Assemblies and meets biannually. (See chronology). "After animated discussion, a resolution was passed which effectively continues the boycott of Nestlé products at this time, but anticipates ending the boycott should the company gain acceptance by the FTSE4Good Index - through reaching FTSE4Good prescribed standards of corporate responsibility." FTSE4Good is an ethical investment index developed by FTSE, the stock exchange listing company. Nestlé would still be excluded from the Index under the FTSE4Good standards of corporate responsibility for the marketing of breastmilk substitutes in force at the time of the 2010 Assembly Resolution. FTSE adopted weaker standards in September 2010 (that is, after the Assembly Resolution) specifically because Nestlé and other baby food companies were not reaching them. Nestlé was included in the Index in March 2011 under the new standards. FTSE Chief Executive, Mark Makepeace, subsequently explained that the standards were weakened because: "In the infant food sector we were not able to engage the companies as they were all being excluded from the index." "The URC Assembly renewed its support for the boycott in July 2010. I would be very surprised if church members expected their Resolution to lead to the Church ending support for the boycott in this way, against the advice of Baby Milk Action and while Nestlé continues pushing its formula around the world with prohibited practices that contribute to the unnecessary death and suffering of babies. Nestlé's ongoing violations of the international baby food marketing requirements mean that it would not pass the relevant criteria for inclusion in FTSE4Good at the time this was referenced by the Assembly Resolution in July 2010. Unfortunately, the criteria were weakened in September 2010 by FTSE with the express purpose of bringing baby food companies into the Index even while violations continue. I am quite shocked that this matter did not go back to the Assembly for review given that it is the FTSE4Good criteria that have changed, not Nestlé's marketing practices, but this is an issue for URC members to address if they wish. "Baby Milk Action will now have to spend scarce time and resources to help partners in developing countries counter misinformation about this announcement, when we should be focussing on strategies that do work to hold companies to account, such as the Nestlé boycott and our work for legislation. Nestlé continues to be the worst of the baby food companies, the most boycotted company in the UK and one of the four most boycotted on the planet. This is a sad day for health campaigners and a disaster for the mothers and babies we are seeking to protect. We will continue to promote the boycott and hold Nestlé to account, and thank the public for their support in this." URC Church and Society has informed Baby Milk Action that it remains fully committed to the health of babies and infants. The United Reformed Church was a long-time supporter of the Nestlé boycott and for many years provided a small annual grant to Baby Milk Action. The original 1992 URC Resolution supporting the boycott specifically called for URC churches and bodies to be alerted to Baby Milk Action. Baby Milk Action is, therefore, particularly saddened that it only learned that URC Church and Society was reviewing support for the campaign after officials had already met with Nestlé twice, produced and distributed a briefing paper and put a Resolution on the agenda of the 2010 URC General Assembly that would have opened the way to investing in Nestlé and ending the boycott had it been passed. Instead the Assembly votes "to defer a proposed ending of its 18-year boycott of Nestlé" by adopting an alternative Resolution requiring Nestlé to reach FTSE4Good-prescribed standards of corporate responsibility. As explained above, the standards in force at the time are subsequently changed, allowing Nestlé to be included in the Index. Nestlé has been using its inclusion in the FTSE4Good Index around the world in attempting to counter moves to hold it to account over its baby food marketing practices and is expected to do the same regarding the URC announcement (see, for example, Reuters 13 April 2011). FTSE has asked Nestlé to stop misrepresenting what inclusion in the Index indicates. Left: Nestlé promotes its formula around the world with health and nutrition claims and other prohibited practices. 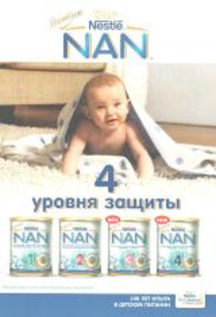 Here it claims its formula "protects" babies in a leaflet distributed to health facilities in Armenia - one of the violations being targeted in Baby Milk Action's current email Nestlé campaign. Babies fed on formula are more likely to become sick than breastfed babies and, in conditions of poverty, more likely to die. The "protect" marketing strategy has been launched by Nestlé in 120 countries and it is refusing to drop it. Such claims are prohibited by the International Code of Marketing of Breastmilk Substitutes and subsequent, relevant Resolutions of the World Health Assembly. Nestlé does not use the "protect" claim in countries that have implemented the international marketing standards in strong legislation, such as Brazil and India. 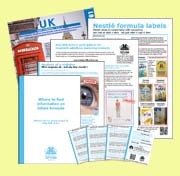 Nestlé discontinued the claim that its formula is "The new 'Gold Standard' in infant nutrition" after this was targeted in Baby Milk Action's 2010 email Nestlé campaign. For further information contact Mike Brady on (UK) 07986 736179. (International) +44 7986 736179. 4 December 2009: URC officials meet with Nestlé Vice President Niels Christiansen, (the coordinator of Nestlé's anti-boycott strategy), and Nestlé Corporate Affairs staff as part of the Church Investors Group. Baby Milk Action is not informed the meeting is taking place and so has no opportunity to brief participants. 21 June 2010: Baby Milk Action first learns that URC Church and Society officials are proposing the Church drop its ban on investing in Nestlé and about their meeting with Nestlé's team. The proposal is already on the agenda of the imminent URC Assembly. Baby Milk Action is informed that the URC Church and Society began to review its support for the boycott three years earlier, prompted by the Methodist Church Central Finance Board (CFB) decision to invest in Nestlé in 2006 in what was presented at the time as a complementary strategy to the Nestlé boycott. According to a URC briefing paper: "When the URC Church and Society report [on the Methodist Church Central Finance Board decision] was placed before General Assembly [in 2007], one speaker asked that the Committee re-visit the issue and since then the Ethical Investment Advisory Group (EIAG) has agreed that the issues should be kept under review." "One delegate representing both the Methodist Church and the URC noted that, in his view the Methodist change in policy had been used by the company and misrepresented them. Could Nestlé provide assurances that any decision the URC makes will not be similarly misused?" Mr. Christiansen reportedly professed ignorance that his anti-boycott team was misrepresenting the CFB decision and promised the URC representatives that Nestlé, "would not seek to promote any decision in the company’s own public relations interests." (Click here for further details on the CFB decision to invest and its repercussions). 28 June 2010: Baby Milk Action meets with URC Church and Society and raises concerns about ongoing systematic violations by Nestlé and the fact Baby Milk Action had not been consulted about the move to invest in Nestlé and end support for the boycott. Baby Milk Action is concerned that a 40-page briefing is being circulated to the Assembly, which includes unfounded allegations regarding Baby Milk Action's motivation for continuing to promote the boycott campaign and outdated information. Baby Milk Action addresses some of these issues on its Campaign blog - click here. It is offered a right-to-reply in a one-page briefing to be circulated to the General Assembly. 4 July 2010: Baby Milk Action's briefing (left) is not circulated at the General Assembly on the grounds that certain aspects "left the URC vulnerable to possible litigation by Nestlé". The original paper is available by clicking here (an updated version with references is available by clicking here). Nestlé had also been given the opportunity to provide a one-page briefing paper, which is not distributed either. Nestlé has never taken legal action against Baby Milk Action over its allegations of malpractice. However, Baby Milk Action has in the past won a case against a Nestlé anti-boycott advertisement in which the company claimed to market infant formula "ethically and responsibly". In any case, the URC Assembly takes a consensus decision to reject the move to invest in Nestlé and renews its support for the boycott. The Resolution states: "General Assembly resolves that if Nestlé obtains listing on the FTSE4Good Index, Mission Council be instructed to rescind the boycott on Nestlé products outlined in the Assembly 1992 resolution." September 2010: FTSE revises FTSE4Good criteria for breastmilk substitutes to allow companies to be included in the Index even while systematically violating the International Code of Marketing of Breastmilk Substitutes and subsequent, relevant Resolutions of the World Health Assembly. 11 March 2011: FTSE announces that Nestlé has been admitted to the FTSE4Good Index on the basis of the new criteria, looking to company statements rather than practices on the ground. The FTSE4Good Breastmilk Substitutes Committee does not request marketing materials from Nestlé to review, though it could have done so even under the weaker criteria. "The evidence available to us suggests that all breastmilk substitute manufacturers currently violate the International Code routinely. We are therefore following the inclusion of Nestle on the index carefully and will be looking for evidence that their marketing begins to comply with the Code." A UNICEF HQ spokesperson tells Dairyreporter (22 April 2011): "I can confirm that Nestle violates the code." Nestlé would not have been listed under the FTSE4Good criteria in place at the time of the URC Assembly Resolution. FTSE later informs Baby Milk Action that excluding companies from the FTSE4Good Index for violating the marketing requirements was: "something of concern to the FTSE4Good Breatmilk Substitutes Committee as they would like to see criteria where some companies are able to meet the standards. For most sectors approx half the companies are included." FTSE Chief Executive, Mark Makepeace, later suggests that the standards were weakened because: "In the infant food sector we were not able to engage the companies as they were all being excluded from the index." However, past statements suggest engagement had been taking place - click here. 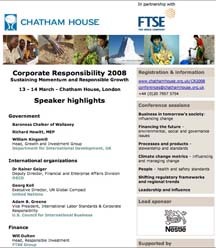 It is also found that Nestlé had sponsored a key FTSE/Chatham House event on "Corporate Responsibility instruments" (left). 14 March 2011: Baby Milk Action receives an announcement from URC Church and Society reporting Nestlé's inclusion in the FTSE4Good Index under the revised criteria, which states: "Based on this information, the United Reformed Church will be issuing an instruction to its Mission Council meeting in May to terminate the boycott of Nestle products as per last year’s resolution of the General Assembly in Loughborough which stated that 'if Nestlé obtains listing on the FTSE4Good Index, Mission Council be instructed to rescind the boycott on Nestle products outlined in the 1992 resolution.'" Baby Milk Action asks if it is not more appropriate to take the matter back to the Assembly given that Nestlé would not have been admitted under the FTSE4Good criteria in place at the time of the General Assembly in Loughborough and continues to violate the marketing requirements "routinely". It is told the Resolution is binding on all members of the Church. Baby Milk Action prepares a briefing for the Mission Council pointing out that it is the FTSE4Good criteria that have changed, not Nestlé practices, and asking it to at least wait until the results of FTSE's planned assessment of Nestlé's activities on the ground are available. In the event, the issue is not discussed at the May meeting due to lack of time. July 2011: FTSE commissions an assessment of Nestlé practices in two countries, but selects countries with exemplary legislation in place where violations are unlikely to be found. Monitoring experts in the International Baby Food Action Network (IBFAN) advise FTSE to look at countries without strong legislation and suggests specific countries were violations are commonplace, offering to assist with the monitoring process. FTSE refuses this offer and states that is has been "collaborating" with URC in the assessment process and other organisations, including the Methodist Church CFB (which holds over £1 million in Nestlé shares and so now profits directly from its baby food marketing practices). Baby Milk Action initial response on the FTSE decision to weaken the FTSE4Good criteria in March 2011 had been "Will FTSE4Good's Nestle gamble work?" and it was suspending judgement to see if the assessment process would help prompt changes to Nestlé practices on the ground. Given that FTSE refuses to address IBFAN's concerns over the countries selected, the fact the assessment is being conducted against Nestlé's policies (not the international marketing standards) and other serious flaws, Baby Milk Action is forced to conclude the process is no longer credible and is likely to be counterproductive. Nestlé is already exploiting its inclusion in the Index to undermine the campaign to hold it to account. Baby Milk Action produces a briefing paper recommending people do not invest in FTSE4Good tracker funds if they are concerned about baby food company marketing practices - click here. 25 November 2011: The URC Mission Council meets again and the "instruction" to terminate the boycott is enacted. The results of the assessment of Nestlé's practices on the ground in the two countries mentioned above have still not been released. Baby Milk Action is later informed that its briefing on FTSE4Good was discussed. It is also told that the decision-making process involved a Resolution being put by the URC Mission Committee (which now represents Church and Society issues) to rescind the boycott of Nestle based on its listing on the FTSE4Good Index and this was adopted by the Mission Council after discussion (with some members expressing disagreement with this decision). 26 November 2011: Baby Milk Action receives the press release issued by the URC the previous day and prepares this statement. The authors of the URC press release suggest that Nestlé's "listing on the FTSE4Good Index demonstrates good faith" even though Nestlé has not had to make a single change to its marketing practices to be included in the Index and executives rejected 97% of the violations included in the global monitoring report Breaking the Rules, Stretching the Rules 2010. 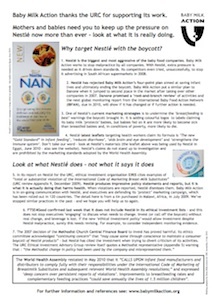 The four violations Nestlé did stop include the leaflet targeted as part of Baby Milk Action's email Nestlé campaign referred to above, demonstrating the importance of the boycott for stopping malpractice and the need for increased support. 3 December 2011: Baby Milk Action is assured that URC remains fully committed to the health of babies and infants. It updates this press release and expands the chronology to bring in additional details requested by URC Church and Society and other key facts.